Sarah Nader- snader@shawmedia.com Crystal Lake Central's Madison Helm (left) and Prairie Ridge's Anna Lockwood jump for the rebound during the second quarter of Monday's game at Crystal Lake Central February 2, 2015. 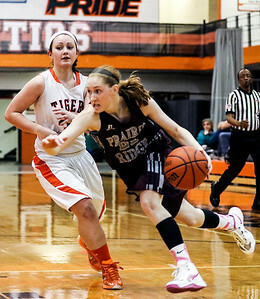 Prairie Ridge won, 56-33. 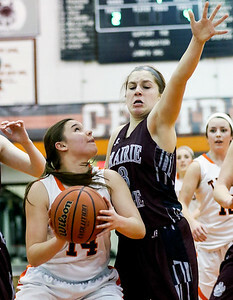 Sarah Nader- snader@shawmedia.com Prairie Ridge's Mikaela McNally (left) shoots over Crystal Lake Central's Madison Helm during the third quarter of Monday's game at Crystal Lake Central February 2, 2015. Prairie Ridge won, 56-33. 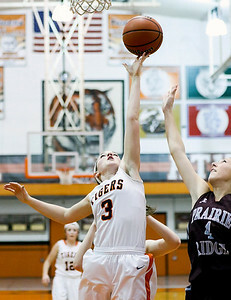 Sarah Nader- snader@shawmedia.com Prairie Ridge's Kirsten Voel-Pel shoots over Crystal Lake Central's Madison Helm during the third quarter of Monday's game at Crystal Lake Central February 2, 2015. Prairie Ridge won, 56-33. Sarah Nader- snader@shawmedia.com Crystal Lake Central's Tatyana Gusakow (left) guards Prairie Ridge's Kelly Klendworth while she shoots during the third quarter of Monday's game at Crystal Lake Central February 2, 2015. Prairie Ridge won, 56-33. Sarah Nader- snader@shawmedia.com Crystal Lake Central's Molly Steffen (left) guards Prairie Ridge's Kelly Klendworth while she dribbles towards the basket during the third quarter of Monday's game at Crystal Lake Central February 2, 2015. Prairie Ridge won, 56-33. Sarah Nader- snader@shawmedia.com Crystal Lake Central's Kathleen Penza (left) is guarded by Prairie Ridge's Melissa Bear while she shoots during the second quarter of Monday's game at Crystal Lake Central February 2, 2015. Prairie Ridge won, 56-33. 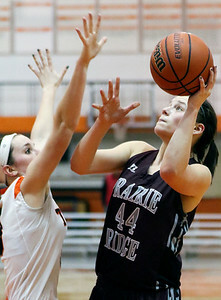 Prairie Ridge's Kirsten Voel-Pel shoots over Crystal Lake Central's Madison Helm during the third quarter of Monday's game at Crystal Lake Central February 2, 2015. Prairie Ridge won, 56-33.